It takes courage to make a message movie these days. In Stalinist Russia, it took courage not to. 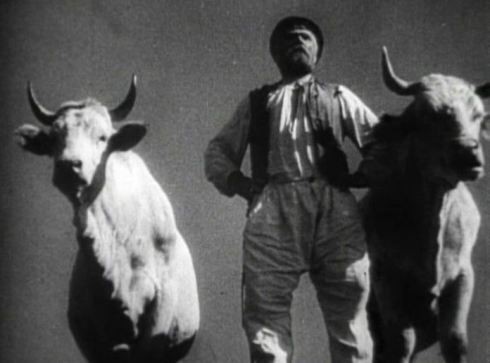 Whatever else you may think of Earth, consider that, in a place and time when Communist orthodoxy was demanded from the top down, with brutal consequences for those who deviated, director Alexander Dovzhenko dared to be ambivalent. Earth is the movie it is, in part, because of where its story takes place. Set in the Ukraine, it depicts the beginning of the end of privately-held farms owned by wealthy men—a system that survived longer in the Ukraine than it did in other parts of the Soviet sphere. Ukrainian soil was richer; its people considered themselves distinct from the rest, and Russia, for a time, tolerated their demands for special consideration. But by the close of the 1920s, Stalin had had enough. He vowed to crush the Kulaks (wealthy landowners) and bring the Ukraine in line. Earth was filmed at this time. Did Dovzhenko think his homeland was changing too fast? It would explain why he made a movie devoted not to the new ways, but to the old: to cycles of birth and death, and to God, or at least, the natural forces that inspire ideas of gods. The peasant village where the action takes place could be anywhere, in any time. Only in those moments when politics and technology intrude upon it does it feel modern. Change brings the villagers prosperity, but also conflict, uncertainty, and grief. Maybe the old system in the village was unequal, even exploitative, but the director seems unsure that it was the crushing misery the communists remembered. There’s an almost magic-realist quality to Earth. 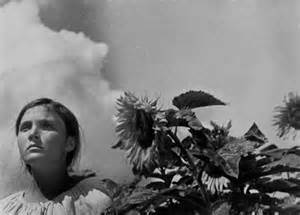 Dovzhenko and his cinematographer, Danylo Demutsky, film a lot of the local flora in funny shadows, or at odd angles, or up so close that they become alien. A bunch of pears begin to look like buttocks; wheat moves through a thresher and we feel like we’re following it—as if we’re in a storm of it. Even the faces of the peasantry seem strange: big, bold, browned. Many of them wear beards in weird styles—some so thick and black that the features around them look like parts of a mask. These villagers occupy nearly equal footing with plants and animals. In one shot, we see a woman’s head and a sunflower’s balanced evenly; in another, a man and two cows assess a situation from a similar vantage point and with, it seems, a similar expression. At first the effect is comic. 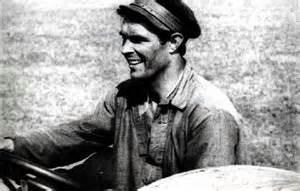 Dovzhenko doesn’t mind laughing at these rubes a little bit. But they are hard-working and capable people, so the joke fades and we grow to respect them. And wonder at their way of life. And wonder, maybe what they might be giving up. To be sure, the wealthy farmers are portrayed badly. Their representative is a spoiled rich-man’s son, who commits a serious crime for petty reasons. He’s the entitled type who made revolutions like Russia’s feel necessary. But the revolutionaries seem lacking too. Chief among them is Basil (Semyon Svashenko), a handsome youth who speaks out against the old ways, calling upon his toiling dad to pick up the Communist cause with him. Basil has practical reasons for breaking with the past: he can get a tractor through his connections, which will increase his yield and reduce his workload substantially. His dad is non-committal. Powerfully built, with a rueful grin, chin always up, resolve never wavering, Svashenko brings a slightly cruel edge to his character. In one of Earth’s most remarkable scenes, we see the young man drunk, dancing a traditional jig, alone, at night, on a dusty road. His feet hit the ground heavily as he dances, kicking up halcyon clouds behind him. It’s as though he’s opening an infernal pit in his wake. What kind of man have these villagers got in their midst? Who is their savior? A History professor of mine once mused that Communist countries didn’t eliminate religion--they just reworked it. Communism, he suggested, was a political philosophy that proposed to explain human history, giving meaning to its processes and providing a means of predicting its future. In this sense it had more in common with Christianity than the revolutionaries cared to admit. Earth reminded me of that idea. 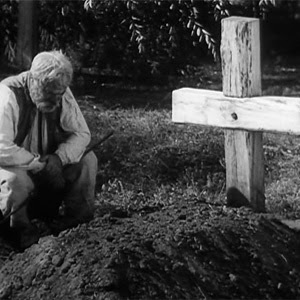 Not when it comes to rejecting traditional religion, mind you—on that count, Dovzhenko is a good soldier. Rather, it’s in the suggestion—plausible, but politically awkward—that the peasants might forge a new orthodoxy to take religion’s place, complete with new rituals and trappings. “I’m asking you to bury him in a new way…let them sing new songs of the new life,” says a grieving man about his dead son, right after turfing a priest from his front door. But it makes sense in a village like this. This is a place where the connection to the land is older than memory and impossible to ignore. And where any political system, no matter how down it may be with the working man, is bound to look temporary. Basil will make a splash, but he won’t have been the first. And one day he’ll return to the earth, and the plants will flower just the same. Earth is available on DVD through Kino International. 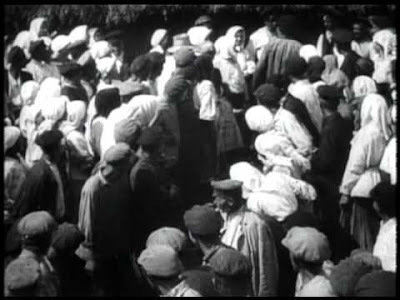 The film is packaged with Vsevolod Pudovkin’s Chess Fever (1925) and The End of St. Petersburg (1927). A sober and balanced assessment of a film that absolutely needs to be looked at through the framework of its time and place. Bravo, mate! Wow – this sounds like an amazing film. I really enjoyed your well-written, thoughtful post. I enjoyed your thoughts on the movie. My Ukranian-Canadian-American father-in-law didn't have anything good about the way the Soviets had treated his family. Thanks for sharing with all of us.